August 2002 and our small group waited in the Canadian night for the train to arrive at Foleyet in Northern Ontario. The single light bulb on the platform the only illumination. The stars were out in a magnificent display unspoilt by atmospheric pollution. The northern boreal forest and millions of mosquitoes surrounded us, all unseen in the dark. Eventually the train could be seen and heard down the line, bright headlights slowly increasing in size as it neared. Several minutes later and nearly an hour behind time, three giant diesel locos slowly pulled into view. Each appeared the height of a two-story house and pulled far too many carriages to count. In a flurry of activity our four Canadian canoes and equipment were loaded into the baggage cars and within minutes our journey commenced through the blackness of the northern forest night. We were dropped off two and a half hours later at the side of the track, the train departed and we were left in the darkness. We could have been anywhere. There was no going back now. 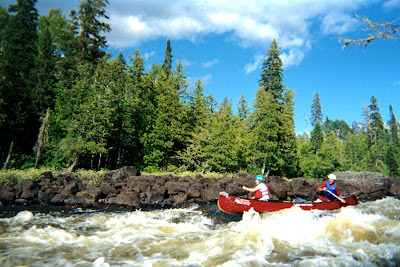 We were committed during the next several days to over a hundred miles of paddling the upper section of the Missinaibi, a Canadian Heritage River in northeastern Ontario. It is over 350 miles long and offers one of the longest, unimpeded stretches of wilderness river environments found in Ontario. We put up our tents on the small clearing next to the line. The temperature outside, even this far north, and at night, was the middle twenties. The following morning we got our first glimpse of the river, packed our gear and loaded the canoes. The first rapids soon appeared and Greg, one of our two guides, suggesting a plan of attack. Trish and I elected to go last (we didn’t want to be the first to make fools of ourselves) and I watched in trepidation as the four others made the descent through the only possible route. Our turn came and apart from bumping a couple of boulders we were safely down. We were relieved, even if we didn’t manage it in great style. At least we didn’t go for an early swim. We soon discovered that river levels were rather low for August making the rapids a little easier than expected, however there was a lot of water going down this river and there was no room for complacency as we were hundreds of miles from any help should problems arise. This was the first of numerous grade III & II rapids. Our first portage came soon on the first day, not because of a rapid, but because of a massive log jamb. It must have been there some time because it was marked on the map. This log jamb gave evidence of river levels twenty to thirty feet higher in spring when the river was full of melt water. Some of the trees were two or three feet thick and up to eighty feet long. Most portages were marked, as the river was once an important link on the fur trade route from Lake Superior to the Hudson Bay. We paddled by many beaver lodges, which to the uninitiated look like huge piles of driftwood on the banks and quite unlike the beaver dams I had expected. As the morning progressed, the wind strengthened so we rafted our canoes together and erected a makeshift sail from a tarpaulin. This was great fun but difficult to steer. We finished the days canoeing at around three thirty in the afternoon, camped beside a rapid and had an enjoyable relaxing swim in the warm waters, which was an unexpected surprise as the rivers we normally paddle are never that warm even in summer. The next morning was sunny, the temperature creeping up into the middle twenties. The river was slow moving between rapids so paddling the loaded canoes took some effort especially when the wind was not on our backs. We savoured the sounds, sights and smell of this wilderness river and kept our eyes peeled for moose and other animals evidenced by many footprints on the banks. Most of the rapids we ran laden except Greenhill rapids where we portaged the packs over what was to be one of the longest portages of the trip several hundred yards of ups and downs through the forest. Like most of the portages this one was marked and free from fallen trees. In the undergrowth at the end of the portage an abandoned canoe lay broken and twisted. A reminder of what could happen when things go wrong. The next rapid had hidden in it ‘a can opener’ as the Canadians call them. Just below the surface an angry fan of water was being pushed upwards by a very sharp rock just visible inches below the surface. An error of less than a foot on either side and our canoes would be joining the previous one. Luckily we all managed to miss it. A Broad Winged Hawk spiralled overhead, followed an hour later by an Osprey, the first examples of the many raptors on the river. 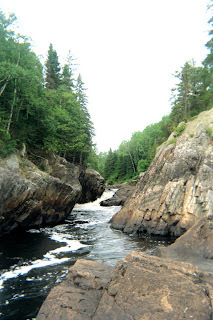 That night we camped beside St Peter’s Rapids and enjoyed a refreshing swim in the river. At Split Rock Falls, the river cascaded noisily down a narrow gorge impassable by open canoe thereby involving another portage. This was followed a little later by the aptly named Thunderhouse falls where the river ran through a narrow canyon into a massive pile of boulders and then into a pool some hundred yards across where we camped on a sandy site amongst the pines. Huge fallen trees, washed down in floods, littered the banks and others were wedged high in the canyon walls. During the night, it rained, the wind got up and a resounding crack close by told us a large tree had toppled in the wind. Thankfully not on us and I was glad we had pitched under an already partly fallen tree which looked secure. In the morning we discovered fresh Black Bear footprints close by. The following day we paddled 25 k and saw more wildlife including a Broad Winged Hawk being chased for several minutes by a much smaller Merlin. We also passed the portage to Brunswick House, a once famous trading post built between 1789 and 1796 and now deserted in its lakeside setting. Our camp was on a small island and we spent the evening in front of the campfire, enjoying the last of the red wine. I always recommend red wine for insect country. You don’t notice the insects in the glass and this avoids having to rescue them prior to drinking. I guess Guinness would do too. The river was gradually getting much wider and much shallower. There were large boulders hidden menacingly just below the surface so concentration was needed at all times. We passed many submerged boulders within inches and I hoped Trish at the front would avoid them. A strong breeze on our backs saw another attempt to sail our canoes. This, like the first, was fun but in the confines of the river was difficult to steer effectively. At Pond portage several fallen trees blocked our way. We took out saws and removed some of the obstructions making the passage easier for those who followed. 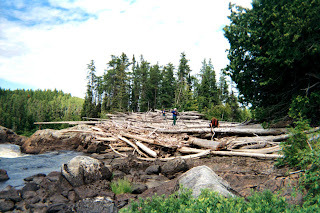 The large fallen trees strewn about the portage gave evidence of much higher spring water levels with large gashes in their upper trunks caused by ice and other trees hitting them in the spring thaw. A chilling reminder that this was a remote and potentially dangerous river was another intact canoe washed ashore on the other bank; no doubt, it was once pinned in higher water levels; it’s owners having to leave it to its fate until lower water levels released their grip. Three Loons – Great northern Divers swam in the river ahead, their haunting cries echoing across to us. Their sound, synonymous with the northern wilderness, continued long into the distance as we passed them by. This was our longest days paddle of 31 k.
An early start the next day- well, 9am! We were immediately into grade two rapids and much sideslipping and back-ferrying around boulders, falls and narrow shoots. A strong headwind made paddling hard until we came to Albany rapids, the longest of the trip and consisting of a mile long rock garden. Our first Bald Eagle soared overhead as it too explored the river and a pair of otters played in the river. Greg, had been told of a new campsite at the bottom of Albany Rapids. We found it set back a short way from the river. It was obviously little used, heavily overgrown and needing much clearance and levelling. This was a much better prospect than another ten kilometres of paddling that day so we set to with saw and axe to upgrade our site. Swimming in the warm water later, we were watched by an Osprey on a nearby tree and were rewarded later as it flew to the rivers edge and had a wash in the river a few yards from our camp. Getting out of the tent in the middle of that night for a leak I was greeted by the ethereal sight of a luminous green area a foot across which on investigation in the morning proved to come from a much rotted tree stump. Within minutes of setting out the next day, we were soon navigating easier rapids. As we manoeuvred down one, I saw our only black bear of the trip rapidly retreat into the forest. On our seventh and penultimate day on the river, rain came in from the west and we donned waterproofs. We battled against the wind and rain only to face a long and wet portage around Big Beaver rapids where we thankfully set up camp. Although we had spare clothing both Trish and I were quite wet and cold and we regretted not bring better waterproofs with us. Peter, as he had at most of our camps, went off fishing and returned with Walleye and Bass, fish we readily ate that evening. A big tarpaulin was erected over an upturned canoe, which was serving as our table, and we got some relief from the steady rain. Our final day on the river commenced with a steady drizzle. Donning our still damp fleece jackets we were on the water for 8:30 and immediately encountered the first rapid which we paddled down without any scouting. We also encountered our first of two portages that day, the first a short 60 yards and the second 200 yards, which was made difficult by having to negotiate wet logs and slippery rocks. Here in the mud we saw a fresh wolf print filling with water. Unseen in the forest we were being observed! Greg and Emily put on a steady pace. We knew Greg had to meet our outfitters at 2pm but Emily’s hurry was motivated by the prospect of seeing her boyfriend. Stopping on the water only twice for snacks we paddled on. Luckily the rain held off although we had light showers, which were thankfully on our backs. The river, now much wider, was shallow enough to wade. Avoiding going aground or hitting an unseen boulder in the current meant there was little time to relax. As we neared Mattice and the end of our trip, we came across the first of man’s intrusions into the wilderness. The remains of an old tin shed rotting at the end of a portage and the first of several houses stood amongst the trees. Later in the afternoon the roofs of Mattice appeared and on the bank an old Cree Indian burial ground, a reminder that we were just tourists in this land. Just beyond the Trans Canadian Highway Bridge we pulled into the bank. This was the end of our journey. As we unpacked, an elderly Cree Indian walked up to us and asked me if there was enough water in the river. Knowing that the Cree Indians had been paddling this river for generations and that this man in particular had spent most of his 71 years hunting and paddling everything from birch bark to modern plastic canoes down the river, I felt slightly intimidated. I could only tell him there was enough for me. I would have liked to talk longer but everyone was hurriedly piling equipment and canoes onto trailers. We crammed into the giant pick-up and were off back to civilization.